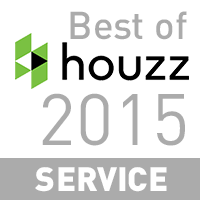 We are proud to be awarded the 2015 Best of Houzz Award for Customer Satisfaction for the third year in a row. The Customer Service honors are determined by a variety of factors, including the number and quality of client reviews a professional received in 2014. According to their website, “Each year, our community of homeowners and home design enthusiasts recognizes the home building, remodeling & design professionals delivering the best customer experience and the most inspiring and innovative designs.” Thank you to our amazing clients!